As I leaned back in Mick O'Brien's barber's chair, I explained to the friendly 27-year-old what I wanted done to my hair: close on the sides and in the back, a little length on top — basically, a shorter variation on the same 'do O'Brien himself sports, sans the burly barber's bitchin' beard. As I have with every barber, stylist and drunken friend who's ever touched my precious ginger locks with a pair of scissors or clippers, I was about to caution him about the cowlicks in the back — ill-mannered little curls that have been the bane of my entire hirsute existence. That's when I saw it. On the white marbled counter in front of a patron a few chairs down, past black salon sinks and multicolored jars holding combs and tonics, sat the real reason I had ventured to the Barbershop: a tall, glistening, deep-red Bloody Mary. "Is that ... a Bloody Mary?" I asked with hesitant wonder, as if I had never seen one before — which, in the context of a barbershop, I hadn't. O'Brien nodded. He nodded again and said, ever so casually, as if this were somehow not the coolest thing that had ever happened in a barber's chair in Burlington: "Yeah, man. Coming right up." We rarely recognize the events that will change our lives in the instants they happen. But that first tangy rush of tomato, horseradish and vodka hitting my lips on a dazzling Saturday morning in mid-October may just have been one. Is that last sentence hyperbole? Absolutely. However, I don't know that I'll ever look at haircuts quite the same way again. Which is to say, sober. With the help of his brother, John, Mick O'Brien quietly opened the Barbershop in September behind O'Briens Salon on Main Street in Burlington. O'Briens is the flagship of the family's hair salon empire, which includes several locations around Vermont as well as a cosmetology school, O'Briens Aveda Institute, of which John O'Brien is the program director. Formerly the home of Clip for Men, the newly remodeled space is sleek and clean, striking a balance between modern chic and classic barbershop warmth. But that's not what makes the shop unique. Beyond a floor-to-ceiling glass wall at the far end of the Barbershop stands the Back Bar, which also serves the salon in the front of the building. 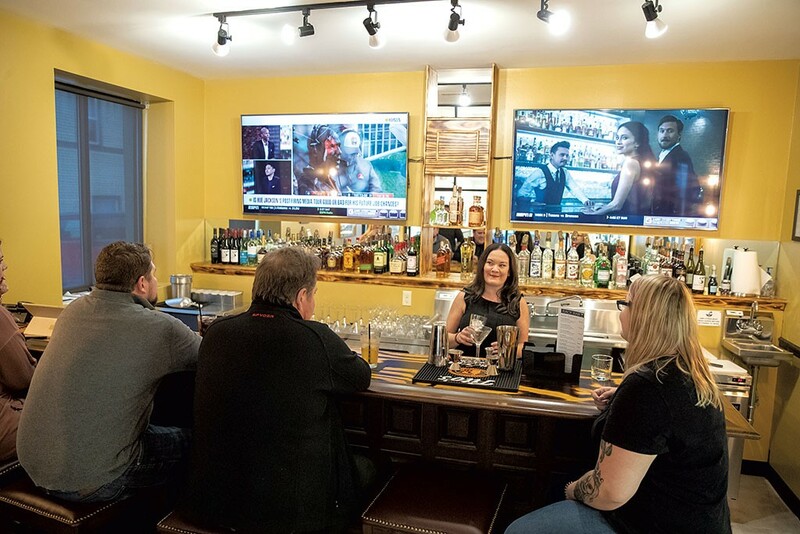 O’Brien believes it to be the first full-service bar in the state to operate in tandem with a barbershop. In March 2017, the owners of Myles Court Barbershop in Montpelier announced plans to open an adjacent bar and restaurant. That space has yet to open and inquiries to Myles Court Barbershop about the expansion were unreturned. A barbershop with booze is a new concept for Burlington, but it's not unheard of in bigger cities. 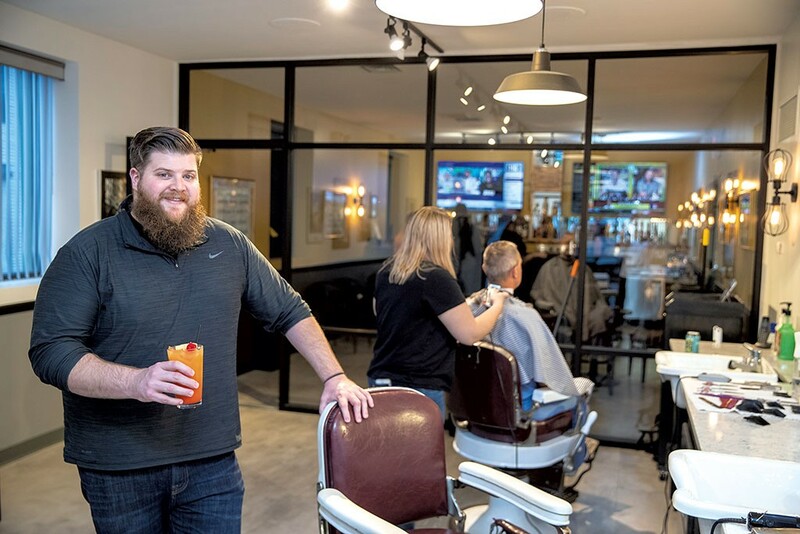 O'Brien, a Burlington native and fourth-generation barber who's been cutting hair since he was a teenager, says he got the idea when he visited a shop in Manhattan called Blind Barber that sports a cocktail lounge in the back. "I love going to barbershops in other towns, because it's a really cool culture," he explained in a later interview. Old-school barbershops are making a comeback, O'Brien added, both locally and nationally. Indeed, several have opened in the area recently, including Old Soul Barbershop in Winooski and Lux Barber Shop in Burlington. "We're trying to build that community barbershop mentality," O'Brien said. Part of creating that vibe is fostering a comfortable environment where patrons can converse not just with their barber but with one another. To that end, the Barbershop offers a key ingredient that other shops don't: social lubricants. "The alcohol helps," O'Brien conceded. "It gets people to talk more." While that's true for patrons, the barbers, like any service industry workers, are prohibited from imbibing while on duty. The Back Bar serves a selection of wine and canned beer — there are no draft lines. A cocktail menu designed by marketing director and longtime bartender Melissa Jayne offers various classic drinks renamed, in that time-honored tradition of hair salons everywhere, with piliferous puns. The Pompadour is a Maker's Mark Manhattan. The Cosmetology is a straightforward cosmopolitan. My Bloody Mary is called, appropriately enough, the Red Head. One can also opt for the Shave & a Haircut: a can of Narragansett Lager and a shot of Jack Daniel's. Those concerned about clippings accidentally garnishing their drinks can ask to be served in a plastic cup with a lid. The O'Brien family has operated salons in Burlington and beyond for more than 60 years, making Barbershop simply the latest in a long line of innovative business ventures. In the 1960s, Bill O'Brien Sr. opened a 28-chair barbershop and salon on Main Street in the space that now houses the Bern Gallery. That size was unprecedented in Burlington at the time, as was combining men's and women's services under one roof. In the 1980s, the O'Briens opened a string of budget salons called Haircuts for Less. Now known as Haircuts Plus, they were modeled after the national franchise Supercuts. The family also operated a tiki-themed salon called Bimini Bill's. At its height, the O'Briens empire included salons in five states. "There's no such thing as an original idea," said Tim O'Brien, Mick's dad and the third generation of the family hair dynasty. "It's being aware of what's going on around you and then being able to take an idea and adapt it to your surroundings. That's what Mick and John have done here." Mick O'Brien noted that he and the staff are still ironing out kinks, such as sorting out operating hours and staffing arrangements for the Back Bar. Eventually, all of the barbers and stylists at both O'Briens and the Barbershop will be licensed to serve alcohol. At present, only a handful of staffers is able to mix and serve drinks. The Back Bar hasn't yet developed a clientele beyond shaggy patrons seeking a cut, O'Brien said, but he hopes it will. The room has a cozy feel, with a handful of stools along the polished wood bar, two TVs and a couple of tables near the back. O'Brien envisions a lively lounge, not unlike the one at Blind Barber in NYC, where people often stop in just for a drink. "Hopefully they have a couple; then they're like, 'You know what? I need a haircut,'" joked O'Brien. "We'll probably do a lot of Mohawks. We'll make them sign a waiver or something." The original print version of this article was headlined "Buzzed Cuts"